Gorsky just embarked on a trip to the country, where he met with everyone from strategic partners dedicated to tackling rising rates of cancer to young healthcare leaders of tomorrow focused on new ways to address HIV in the region. 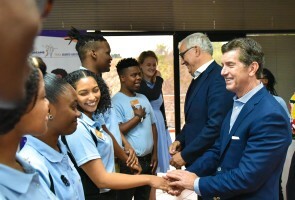 On the heels of his trip, we took the opportunity to sit down with Gorsky to hear more about the innovative work Johnson & Johnson is doing in South Africa—and what he thinks the next 90 years will look like. Q: Why is our connection to South Africa so important to the company—and to you as a leader? A: Our work in South Africa truly embodies Our Credo, the company mission statement. During apartheid, we embraced the values of equality and inclusivity—when the world demanded divestiture in 1985, we made the decision to stay because we refused to abandon those employees. And we’re proud to be operating today in South Africa, which is a vitally important market and center of hope and progress unfolding across the continent. It's why South Africa is the hub for our work across sub-Saharan Africa, as well as home to our Global Public Health organization’s Operations Center, which opened in 2016. And we’re positioned well for that future growth, with almost 1,000 South African employees. Johnson & Johnson has always championed the integral role women play in fueling the future of human health, so I am proud that more than half of our employees in South Africa are female. Q: How many programs and partnerships does Johnson & Johnson support in the region today? A: We’re involved in more than 100 partnerships and programs in sub-Saharan Africa—work that's being done by various company teams, such as our Global Public Health and Global Community Impact organizations. As a company, we are committed to helping people of all ages and backgrounds live longer, healthier lives in the region, which encompasses everything from improving maternal and infant health to addressing diseases like HIV, tuberculosis (TB) and malaria. For example, our Helping Babies Breathe (HBB) initiative, in partnership with Save the Children, has supported the training of skilled birth attendants in neonatal resuscitation in sub-Saharan Africa—saving thousands of infants across the region. And our work with children—through projects like the Child Aid Doornkop and SOS Children's Villages—helps disadvantaged and orphaned kids gain the important life skills and tools needed for a brighter future. Q: How can Johnson & Johnson have the most impact in South Africa when it comes to combating disease? A: With the opening of our Global Public Health operations in Cape Town, we announced these core strategic focuses: HIV, TB, mental health and soil-transmitted helminthiasis (STH)—areas in which we can have the most impact by bringing together our resources to make a difference for patients and communities. We’ve made profound strides in our work fighting multidrug-resistant TB. It's an increasingly large global health epidemic, and South Africa unfortunately faces the highest burden of it worldwide. We made history by offering the first TB drug with a new mechanism of action in 40 years, helping address unmet patient needs for those with multidrug-resistant TB. 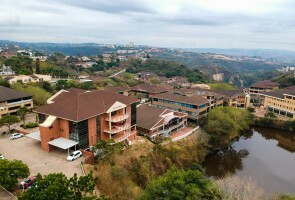 Seema Kumar, Vice President of Innovation, Global Health and Policy Communication at Johnson & Johnson, has described firsthand how patients in Durban previously had very low recovery rates, but now the majority who receive our treatment are able to go home. Talk about making a real impact in the lives of patients. Through our public-private partnership DREAMS, and our work with PEPFAR (U.S. President’s Emergency Plan for AIDS Relief), we’re also addressing the high rate of HIV infections among adolescent girls and mothers across sub-Saharan Africa with initiatives designed to help prevent infections. We also have a collaboration in place with the International Partnership for Microbicides to develop a vaginal ring coated with an HIV-resistant compound to help these young women protect themselves. Finally, as we highlighted in our 2017 Health for Humanity Report, we made history recently with the initiation of the first efficacy study for a mosaic-based vaccine (designed to prevent a wide range of viral strains responsible for the HIV pandemic) that's underway with 2,600 young women in sub-Saharan Africa. Our ultimate goal? Reduce the number of new HIV infections in this population by 40%. Q: Why is improving oncology care in sub-Saharan Africa also a priority for the company? A: We’ve made great progress in tackling communicable diseases, but cancer represents a huge area of unmet need—cancer incidence in sub-Saharan Africa is expected to exceed 1 million cases by 2030. As the world’s largest and most broadly based healthcare company, we need to be there for our patients and address the growing needs of Africa’s population as it ages. To help with some of the structural and systemic challenges around treating cancer in the region—from lack of access to diagnostics to lack of healthcare financing—we’re working in partnership with regional governments, health agencies and NGOs to strengthen the healthcare infrastructure. One way we’ve already made a difference: Janssen, part of the Johnson & Johnson family of companies, made a donation to the National Comprehensive Cancer Network to help develop clinical treatment guidelines for several cancer types in the region, including prostate cancer and Kaposi’s sarcoma, a type of cancer that causes lesions in the soft tissues, and is prevalent in those who have HIV. This means that more people will have better access to the care they need. The foundations of our success in improving access to care rest in building a long-term, commercially sustainable business that is responsive to local conditions. So six of our innovative oncology products are already available in seven countries, with plans to continue to expand our reach and portfolio in the region. These are just some of the ways I'm confident Johnson & Johnson can rise to the challenges of addressing cancer across sub-Saharan Africa. Q: In what ways is Johnson & Johnson leveraging technology to help improve health outcomes in South Africa? A: In conjunction with the South African National Department of Health, we supported the launch of the MomConnect mobile messaging program. The idea is simple but incredibly effective: Pregnant women sign up for the service and receive crucial information about their pregnancy, safe delivery, and infant care and development. The program is designed to reach low-income mothers on even the most basic mobile phones. In three years, we’ve managed to reach 1.8 million moms, and the program is available in 95% of health clinics throughout the country. Q: What is Johnson & Johnson doing to empower the next generation of healthcare leaders and innovators in South Africa? Take the DREAMS Youth Leadership Team, a joint Johnson & Johnson and United Nations Population Fund (UNFPA) initiative that uses peer-to-peer empowerment to reduce HIV/AIDS infections. Girls and young women account for 71% of all HIV infections among adolescents in sub-Saharan Africa, and this program puts the healthcare leaders of tomorrow at the forefront of education and outreach efforts. Last year, we also announced the winners of our first Africa Innovation Challenge in Cape Town. We saw many ingenious submissions around promoting early child development and maternal health, empowering young women and improving family well-being. Q: What lessons have you learned from our work in South Africa that have helped guide you as a leader? A: For me, our work in South Africa really reinforces just how vital strategic partnerships are and why we all need to take a moment and appreciate the life-changing work being done on the front lines of care. When you turn on the news, you’re overloaded with stories about the challenges facing Africa. But when you dig into the work we and our partners across South Africa are doing, you get a totally different view—a story of hope, progress and ingenuity in the service of humanity. And to further these goals, the only way forward is through increased collaboration. It’s how we’ll tackle the largest global public health issues and continue to make progress toward a world without TB and HIV/AIDS. It’s how we’ll live up to our first Credo responsibility to doctors, nurses and patients and to the mothers and fathers who use our products and services. It’s how we’ll change the trajectory of health for humanity.